Pharmavite`s Omega-3 fish oil products use only the oil from wild ocean fish, and do not use oil from farm-raised fish. Each batch of Pharmavite fish oil is processed using state-of-the-art molecular distillation or absorbent technology to assure high levels of purity. All batches of Pharmavite fish oil are guaranteed to pass the stringent standards of the CRN (Council for Responsible Nutrition) Omega-3 Monograph. In addition, Pharmavite`s fish oil products meet the United States Pharmacopeia ("USP") Omega-3 fish oil purity standards as well as comply with all standards prescribed by the United States Food and Drug Administration ("FDA"). Consumption of Omega-3 fatty acids may reduce the risk of coronary heart disease. FDA evaluated the data and determined that although there is scientific evidence supporting the claim, the evidence is not conclusive. Omega-3 fatty acids also help maintain triglyceride levels already in the normal range. Take one to two softgels two times daily with a meal. Keep bottle tightly closed. Store in a cool, dry place, out of reach of children. If you are pregnant or nursing, taking medication, facing surgery, have bleeding problems, or undergoing any other treatment which may affect the ability of blood to clot, consult your physician before taking this product. Do not use if imprinted seal under cap is broken or missing. What are the benefits from taking Fish Oil? 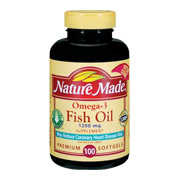 Consumption of Omega-3 fatty acids (as found in our Fish Oil), may reduce the risk of coronary heart disease. Omega-3 fatty acids also help maintain triglyceride levels already in the normal range. Where does the fish in the Fish Oil come from? Pharmavite uses only the oil from wild, deep water, ocean fish; sardines and anchovies. What are the quality standards of your Fish Oil product? What are essential Fatty Acids and what do they do for the body? The Essential Fatty Acids in this product are the omega-3 fatty acids, EPA (eicosapentaenoic acid) and DHA (docosahexaenoic acid), which are utilized by many tissues of the body, such as the eye and the brain. Fish Oil 1200 mg is shipped in a discrete, unmarked package. Orders are processed immediately and usually take about 3 to 5 working days to be received. We do ask that you try it for 2 to 3 weeks to feel the full effects. Any information received is used only for order processing and shipping purposes. Your information, such as e-mail address, will never be disclosed to a third party.